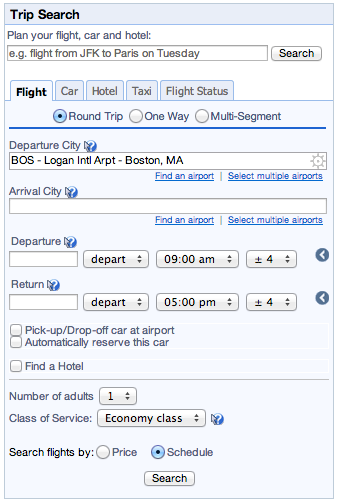 My company uses Concur for travel management, and I am quite happy with their tools. One feature struck my immediate interest, which is their use of natural language processing/understanding (NLU/NLP). Ever since Apple introduced Siri to the mass market, speech assistants have gained public interest. Microsoft came out with Cortana recently. Google has Google Now, even though I wouldn’t necessarily qualify that as an assistant with its typical characteristics (dialog-based, traits of a character, etc.) at this point. However, Siri does not have a text-based interface, and I do occasionally miss that feature. With one simple sentence I gave it all the data it needs to know for my booking, and it is smart enough to assign the values to the respective fields for me. 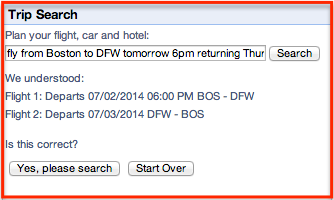 One further click on a button and I can review my flight options. Quite honestly, I experience this as a much more convenient UX than the good old form filling approach. This entry was posted in Uncategorized by Tobias Goebel. Bookmark the permalink.